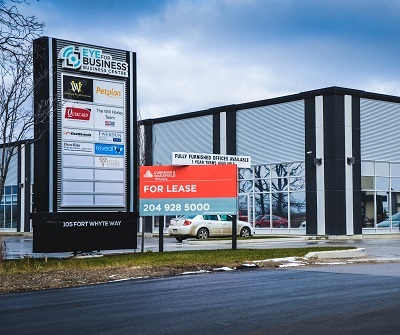 If you're a Winnipeg business owner or an individual requiring comprehensive professional care, take a good look at the Eye For Business Center. This new destination conveniently located just outside Kenaston Commons aims to be your turnkey solution for all your business professional needs. Whether it's finance, law, real estate, IT, or all of the above, the folks under the Eye For Business roof have you covered, and they'll work together with you as a team to coordinate your efforts and save you time and energy. The Eye For Business Center itself boasts a bold aesthetic that stands out from its business sector peers, showcasing both their professional edge and friendly, personable touch. Electra Sign was brought on to help realize this cohesive look. Our first step was installing our high-quality, routed-out building letters. We then followed up by delivering a sharp-looking custom-built LED-illuminated pylon sign that serves to showcase the talent within while seamlessly complementing the Center's architectural elements. Drop by the Eye For Business Center in person or online and see just how much they can do for your business. And whether you're a scrappy start-up, a well-established company, or anything in-between, contact Electra Sign and let us help you to make a great first impression on your clients with signage that stands out from the crowd.